OliNo » Blog Archive » LED, a hype with prospects for museum purposes? LED, a hype with prospects for museum purposes? There lies a collective awareness on the urgency in getting involved with and influencing current environmental issues and climate change in today’s society. This phenomenon is known by the general public as: Greening. It is important, for museums to participate in this occurrence any way possible. To be able to sustain the quality and quantity of our cultural heritage, museums must take matters into their own hands. Visitors (and sponsors) will start demanding it from them. But the real reason museums should start Greening their museums has less to do with a demand from the outside world and far more to do with two essential aspects: an ethical and a financial essence of sufficient and sustainable museum management practice. The European Union has stated that LEDs are ‘the light of the future’. This means that our museums and monuments will be illuminated with LEDs in the mere future, if we like it or not. 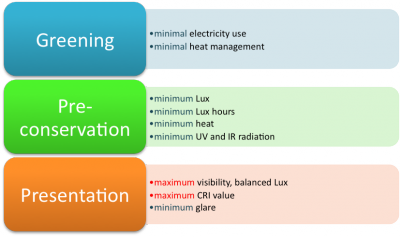 Although manufactures claim that the LED is adequate for museum exhibition purposes, many museums remain resistant. Museums have a large responsibility in taking care of our cultural heritage. They must constantly find a balance between preventive conservation and presentation of all its artifacts to the best interest of the artifacts on display and their audiences. An Outline of Demands concerning: Greening, Preventive conservation and presentation for museum exhibitions designed by Kerman. 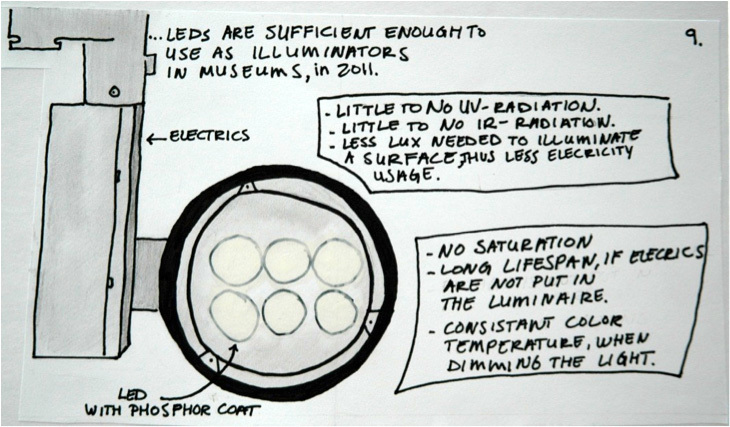 With the current doubts on the effects of sustainability of museum artifacts using LED as an illuminator for museum purposes, you ( especially as a heritage specialist) may start to wonder: If manufactures, such as ERCO, Proliad and Philips state that LED is a qualified lighting source for museum exhibition purposes, then why haven’t more museums invested in LED yet? Can LEDs really live up to museum standards and guidelines? Can museums really finance the LED? And an even more intriguing question, to my opinion is, is it possible that when using LED in a lighting design you will be able to contribute to a new collective perception of cultural heritage in ways we never even thought possible? “In 2011 Dutch society invests more money, time, energy, and creativity in lighting their cheese and meats (with LED) than they do their cultural heritage“, states Scott Geffert ( a visionary during our interview. It is therefore perhaps time to combine technical innovation with aesthetical skills to illuminate the worlds cultural treasures in a sustainable way. 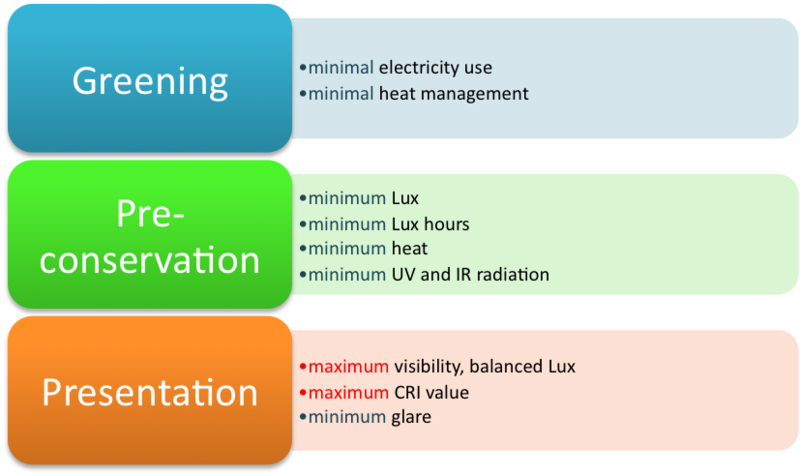 More information about LED for exhibition spaces can be found in the research paper A vision on LED. The research done for this paper consists of the following topics: Finance, New Technology, Sustainability, Pre-conservation, Presentation/Aesthetics and Health issues. I don’t mean to pick on you. Everyone makes mistakes and I make more than average. Keep it as simple and straightforward as possible. Subject – verb – object. Stick to that until you get the hang of it. Then slowly add a bit of flourish. Readers will be thankful. I think its pretty obvious in any language: if you can use 10 words to say something just as easily as if you used 100, you should probably stick to 10. I am certainly not against using LED technology in public buildings. This article tries a bit too hard to associate LED with culture, heritage, vision, sustainability, innovation and in my mind misses the mark completely. Lighting is important for performances, in galleries etc, but let’s be careful we don’t start worshipping LEDs, windmills and solar panels as if they are going to save the world from resource depletion and climate chaos. Not sure if this article deserved this much of my time. And looking back at it: if LED was “a hype” it would soon disappear on its own as the hype wears off. I consider myself part of the general public and I read a lot and ‘greening’ just doesn’t work for me in this context. I just googled it and the first couple dozen results are about greening the desert. That does work for me. Hi Sjoukje, your paper was a great read. I’ve always had the thought that LEDs are the perfect light source for arts and museums because of the light property. As your paper was produced in 2011, have you experience any development in museums switching to LED light source? Interested in Advertising on OliNo? Let start a civilization which provides for its energy using renewable energy. Our organisation will contribute to reach this goal. We found an appropriate name for our organisation, OliNo, which is a word joke for No Oil! It is a combination of two Catalan words:"Oli" and "No". Together they mean "Oil No!" indicating that oil should not be used as combustion to generate energy.